MANJULAKSHETRA or MANJESHWARA is the name derived from the deity “SRI MANJARISHA” or Srimath Anantheshwara of the sacred Manjeshwar Temple. Considered as the most ancient existing temple of the Gowda Saraswat Brahmins, the known history of the Temple dates back to 8th century A.D. The Temple was last renovated in 1799 – 1804 A.D. after it was demolished by a nearly ruler. H.H Srimath Vibhudendra Tirtha Swamiji, the then Peetadhipathi of the Kashi Math Samsthan took the initiative in resurrecting the Temple and re-installing the presiding deity Shri Bhadra Narasimha. MANJESHWAR or Manjulakshetra with its Puranic background is celebrated for its Temple dedicated to Srimad Anantheshwara, that is Shri Shiva accompanied by Shesha or Anantha. Evidently, the town derives its name from the presiding Deity Srimad Anantheshwar changed into “Madanantheshwar” and then into Manjeshwar by efflux of time and long usage. The image of Lord Shiva is believed to be an “Udbhava” or “Swayambhoo” (Self emergent). Besides the image of Shiva, there are in the temple images of Lord Narasimha and Subramanya, the latter Deity rarely worshipped in South Canara. Originally in the Madras State but now in Kerala, Manjeshwar is situated 17 Kilometers south of Mangalore on the Cochin – Mangalore section of the Southern Railway, the Temple is about a Kilometer and a half from the Railway Station, being easily accessible by metalled road. By road, it is about 23 Kilometers south of Mangalore on the National Highway 66. The nearest Airport is Mangalore. The Sanctum Sanctorum The Sanctum Sanctorum (Sri Garbhagriha) has two parts. One can be seen by devotees and the other hidden behind the Altar(Simhasana). The entire Simhasana is built over an anthill called Rohini or Ruvvani in Konkani. Visible at the bottom is the granite Shivalinga of Srimath Anantheshwara after whom the temple is named. This Linga is considered self emerged (Swayambhoo). The period of its discovery is not known. On the second rung are two Deities of Nagaroopi Subramania- one is ancient and the other recently installed. At the centre is Sri Bhadranarasimha – the presiding Deity in standing position flanked by Sridevi and Bhudevi- His consorts. Visible at the top are the idols of Sri Vittala, Sri Vedavyasa, Sri Laxminarasimha, Sri Keshava, Sri Krishna, Sri Karalanarasimha and others. Many other idols are partially visible Including the Utsavamurthy of Utsava Narasimha. These are indicated in the diagram. Manjeshwar, the northern tip of Kerala, bordering Karnataka, is a small coastal village in Kasargod district. Though the sleepy town has not witnessed any significant development like its neighbouring Mangalore or Kasargod, or failed to lure many tourists through its serene beaches, it has succeeded in finding a place in spiritual as well as literary world maps. If Rashtrakavi Govind Pai has put Manjeshwar on the literary maps of India, Srimath Anantheshwara temple revered by Gouda Saraswat Brahmins (GSBs) has put the place on spiritual map of the nation. The panoramic view of the shrine with hills on three sides and river Manjeshwar flowing by, is really fascinating. Incidentally, Manjeshwar or Manjulakshetra is known for its temple dedicated to Anantheshwara, that is Lord Shiva accompanied by Shesha or Anantha. Evidently, the town derives its name from the presiding deity Srimath Anantheshwar changed into ‘Manjarisha’ and then to Manjeshwar by efflux of time and long usage. According to renowned researcher Govind Pai, though the temple is being managed by the GSB community for the past 1,200 years, this temple dates back perhaps to the pre-Christian era. It is also said that the propounder of Dwaitha philosophy — Srimath Madhwacharya, the founder of the present Sri Kashi Math – Guruvarya Sri Vijayeendra Teertha, founder of Sri Natha Sampradaya-Sri Matsyendranath, and many other sages and Mathadipathis have visited and performed their penance in the holy precincts of this shrine. It is also said that prior to the Shishya Sweekara ceremony of his eight disciples (of the Astha mathas) at Manjeshwar (Kanwateertha), Madhwacharya had visited and prayed at Srimath Anantheshwara Temple. The temple like many other ancient temples fell prey to the ravages of man and nature. In 1677, a cyclone devastated certain portions of the temple. It was looted by Muhamed Ali, the ruler of Cannanore and immediately after by a Maratha pirate Angira in about 1755. In 1799, after the fall of Tippu Sulthan who had held sway over South Canara and with the consequent coming into power of the Ruler of Vittal, the latter plundered it and carried away a large booty including a temple – chariot. However, as a result of the representations made by the Gowda Saraswaths to the British authorities, the ruler of Vittal was captured and the properties looted by him were restored to the temple. In 1804, it was renovated by the GSBs and the image of Shri Narasimha known as Shri Bhadra Narasimha was installed by Srimath Vibhudendratheertha, the then head of the Kashi Math. Due to natural deterioration process caused by the passage of time, the wooden roofing and the false ceilings etc., are either damaged or have become weak. On a representation by the chief priest, the temple management consulted experts on the subject. Subsequently, in the general body meeting of 18 petas, a committee was formed to execute the project. Interestingly, the renovation, which is in the last phase, is being done without displacing or disturbing the poojas and other rituals of all holy deities. The sanctum sanctorum has the presiding deity of Shri Bhadra Narasimha with Sri Sridevi and Sri Bhudevi, the swayambhoo (self emerged) Linga of Srimath Anantheshwara and centuries old idols of Nagaroopi Sri Subramanya. Behind the Simhasana (altar), is the sacred ‘Rohini’ or Ruvvani (in Konkani), an anthill — the abode of Sri Vasuki. The ‘Rohini’ is surrounded by ancient idols of Sri Ugranarasimha, Sri Vedavyasa, Sri Keshava and many other deities. Of the many festivals in the temple, the annual car festival which falls on the sixth day of the bright half of the month of ‘Margshirsha’ (November / December) is the most important. The Festival known in popular parlance as the ‘Manjeshwar Shasti’ and coincides with ‘Skanda Shasti’ in other parts of South India. On that day, the six – wheeled chariot called ‘Brahma Ratha’ is pulled along the Car Street by thousands of devotees. The ‘Ratha’ has a base width of 17 feet, a height of 17 feet in raw and a maximum girth of 53 feet. But when decked for the occasion with all its decorative appurtenances, it rises to a height of 71 feet, and affords an unforgettable experience of solemnity and grandeur as it moves amidst a soothing mass of human heads. The Ratha was built in 1834.
marriages, upanayanams, and other socio-religious functions. Manjeshwar is situated 17 kms south of Mangalore on the Mangalore – Kasargod road. There is a bus stop near the temple. However, the temple is about 1.5 kms from the Manjeshwar railway station. Rashtrakavi Manjeshwar Govind Pai’s residence too is located close to the temple. Hidden from public view is the anthill Ruvvani – the abode of Sri Vasuki. 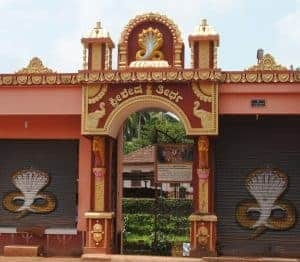 With everence to the live snakes believed to still inhabit the underground paths to the Ruvvani, the entire temple premises inside and outside the Sanctorum have no cement or tiles flooring. Only mud cover is plastered with cow dung from the Goshala. During rainy season water from the roofs is allowed to seep through the flooring in order to keep the snake paths cool. The Ruvvani is surrounded by Lingas of Sri Chandramouleeshwara, Sri. Nandikesha, Sri Kubera, Sri Varunadeva and Sri Veerabhadra. The mud from Ruvvani is offered as Moola Prasad by the Chief Priest only on request. Namaskara Mantapa is now completely rebuilt over the most sacred “NADE” of the temple in front of the Garbhagriha. The divine vibration (saanidhya) of this place is difficult explain but can only be felt. Till 1958 AD the Namaskara Mantapa was narrow and made of thatched roofing and arecanut tree pillars. In 1958 one RCC structure was erected which had deteriorated and had to be removed to enable the renovation of the Temple. The new Namaskara Mantapa: (erected in 2011 AD) has 8 pillars made of black granite from Tamilnadu. The wooden structure and carvings are made from Burmah Teak – around 300 years old. The roofing is made from high quality copper sealed with beewax. The flooring is only of mud covered with a layer of cowdung. The phenomenon of Divine Oracle manifesting from time to time (last witnessed 75 years ago) uses this Nade for interacting with the Devotees in sign language. It is also the requirement of the DEVADARSHAN that the flooring is maintained in its natural form. The central portion of the Namaskara Mantapa: The central Portion covers the Vimana of the Sri Garbhagriha. It has the silver sculpture of Lord Vishnu in Ananthashayana posture flanked by Hanuman and Garuda. The opposite side facing the sanctum has Sri Mahavishnu in sitting posture accompanied by Astha Laxmis – Adilaxmi, Dhanalaxmi, Dhanyalaxmi, Gajalaxmi, Santanalaxmi, Veeralaxmi, Vijayalaxmi and Vidyalaxmi. Immediately after one enters the temple from the Mahadwara, one can see on the ceiling a ‘Navapada’ formation in wooden carving. This is a Vastu of defined formation. There are 81 small squares, each one having pattern which is different from the other. There are 81 patterns in all. This is supposed to be highly potent arrangement and ideal for meditation. It is said to attract and concentrate cosmic energy at its centre. Usually, all temples having Navapada arrangement are with 9 squares, some 25 or even 45. But, Navapada with 81 squares is not found anywhere else in southern India. Manjeshwar Temple also has a 9 square formation in the Mukhamantap ceiling. Among the five Teerthas in Manjeshwar Namely – Sheshateertha, Rama Teertha, Matsyateertha, Chakrateertha and Kanvateertha the Sheshateertha is considered the most sacred. This is a tank on the southwest direction of the temple. The two Swamijis of Sri Kashi Math H.H. Srimath Vasudendra Teertha and H.H. Srimath Varadendra Teertha were given Sanyasa deeksha after ritual bath in the Sheshateertha. Sheshateertha is also used for Jaladhivasa of Naga Idols before Pratishta. A bath in the Teertha followed by Angapradakshina (Madastana) around the Sri Garbhagriha as a mark of total surrender to the Lord is considered to be a very important Seva, in Manjeshwar. On the rearside of the temple is the “Vovala flower Tree” where it is believed that the power of a sadhaka yogi Still pervades. One version says that the great Yogi-Sri Matsyendranath-the founder of the famous Natha Panth performed his penance: (Tapasya) here while on a pilgrimage to all Shiva shrines in the country. His invisible power is still protecting the temple and its devotees. He is still believed to help devotees in their difficulties like Lost or stolen property, sickness in the family etc. A stone is installed on the-temple outer wall to offer coconuts to the Jog;. During the annual festival thousands of coconuts are offered to the Jogi in front of the Deity offer the Rathayatra. Devotees with Nagadosha perform the ritual called Nagapratishta. The Naga Idols carved on granite are installed for permanent pooja after elaborate rituals. These idols are installed on this Katte in front of the temple where on Ashwatha tree is planted. On Nagapanchami day thousands gather here for Nagapooja. Vasantha Mantapa on the left side of the temple is a beautiful mantap wherein Lord sits after Utsavas. The Mantap is fully covered with silver. I consent to Manjeshwar Temple collecting my details through this form.